White almost fills the black eye with a killing shape, the farmer's hat. 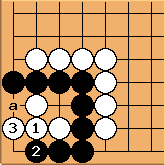 If Black throws in at , White still almost fills the black eye with a killing shape, this time the crossed five. 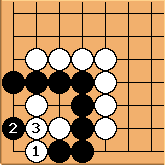 might look like a tesuji at the first glance, but after Black is alive. This looks similar to the success diagrams, but because of the liberty at a Black's eye isn't almost filled anymore. 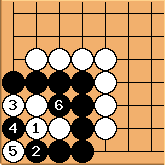 To almost fill White would need to play twice, but thus can't achieve a killing shape anymore. 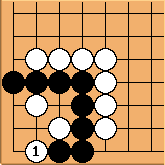 The result is seki. 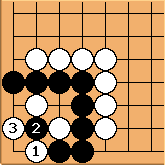 If White tries to make a ko with , this fails as well as Black has enough liberties to crush the ko with . fails, after Black answer with the best White can achieve is seki with .